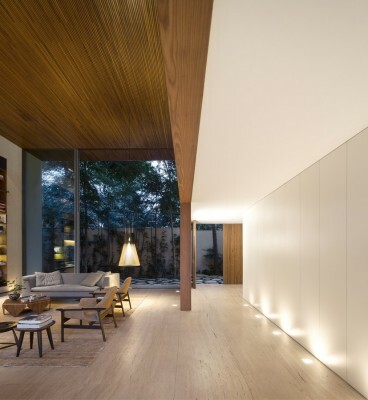 A wooden volume in line with the eastern façade – with a little more 2.85m high and 19m long – rests within a ceiling height of 5.15m and 11.75m in the front. 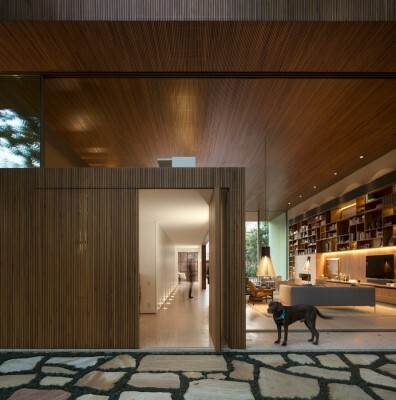 Configuring a permeable space between the entrance and the back of the lot, the living room is the emptiness that results from this organization of the plan on this lot. 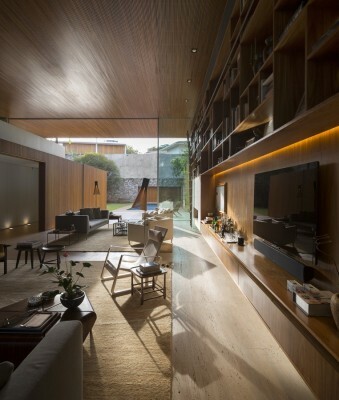 The space is delimited – together with the eastern façade – by a wooden shelf that contains the library and a fireplace. 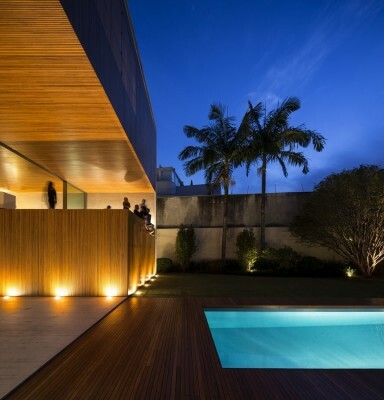 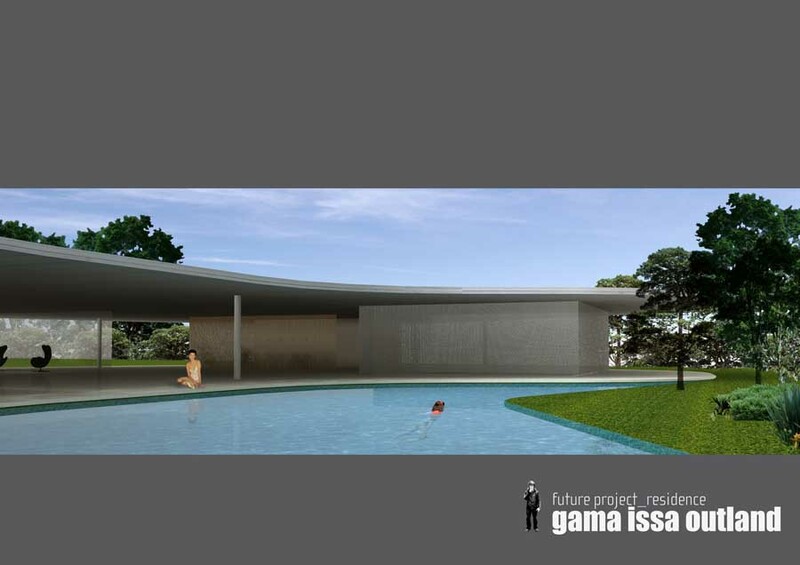 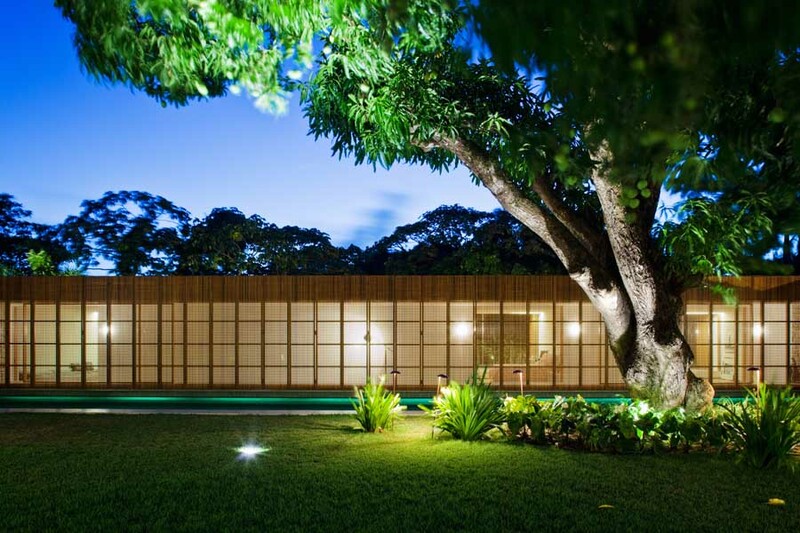 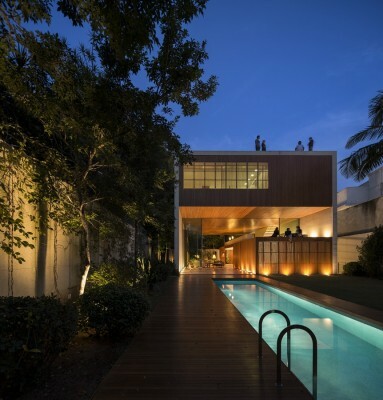 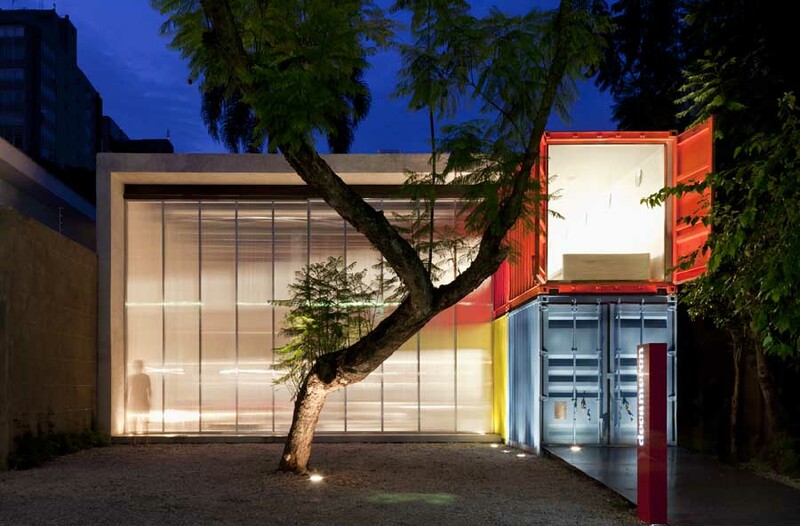 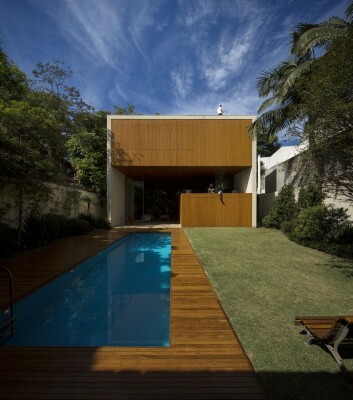 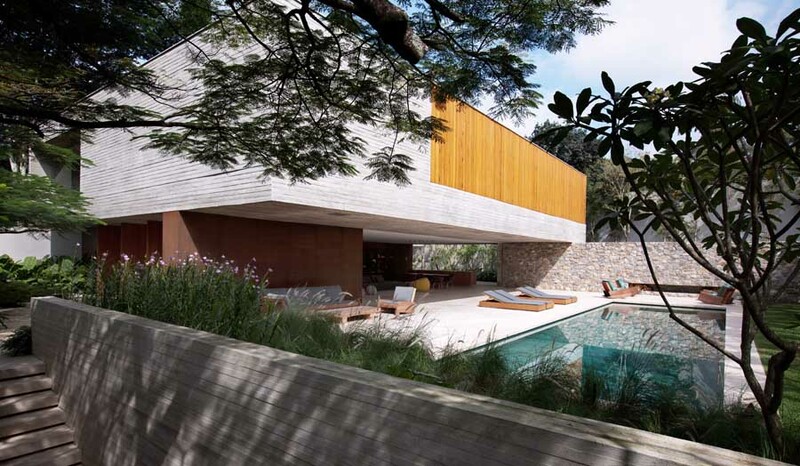 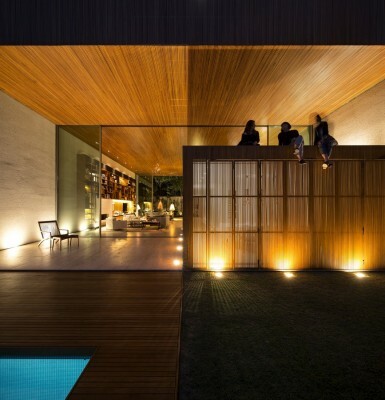 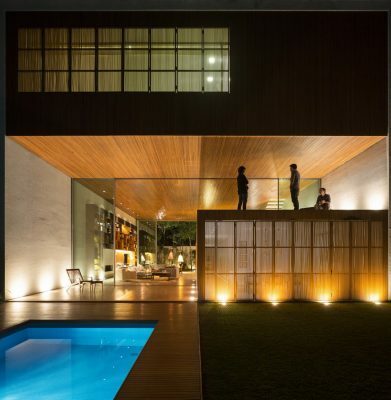 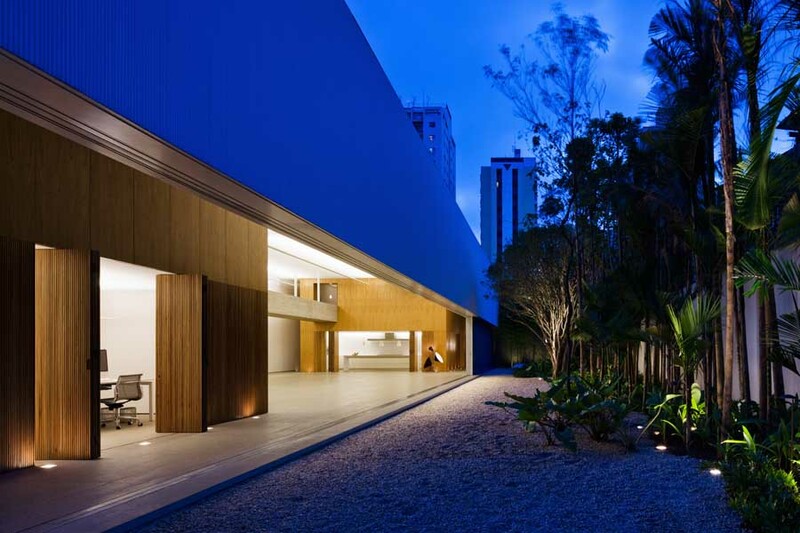 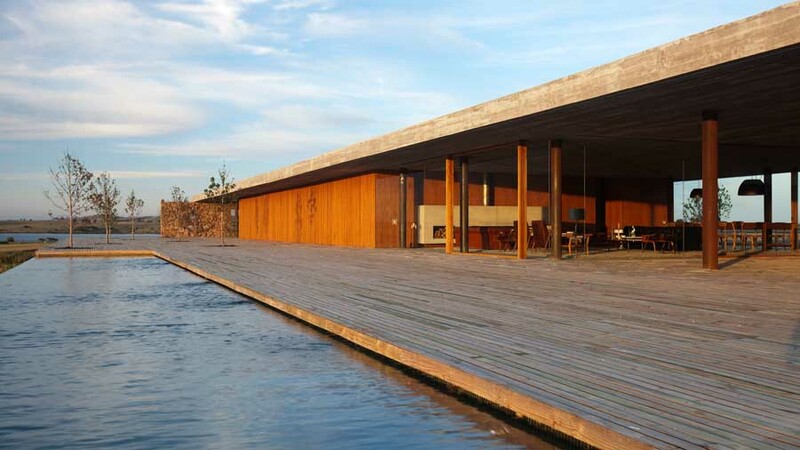 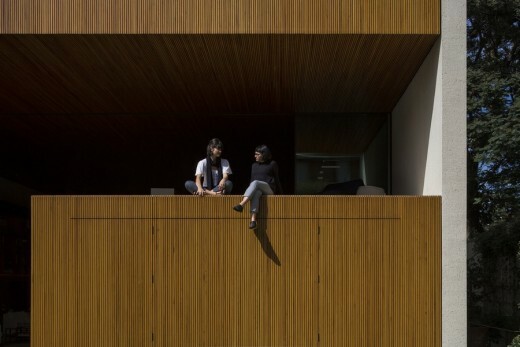 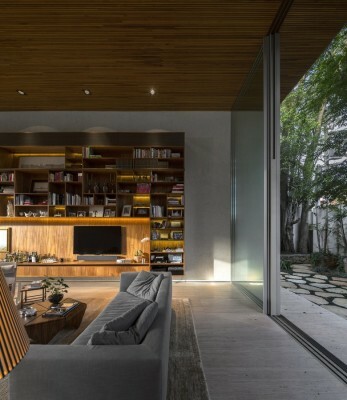 This is the architectural design of Tetris House, located in São Paulo. 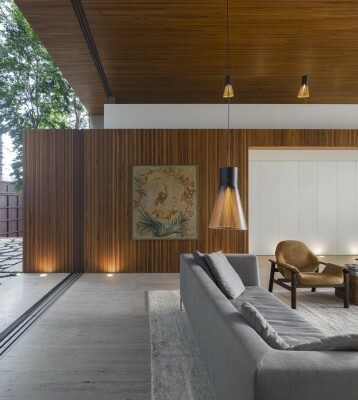 The wooden Box on the lot shelters on the inside, the washroom, the stairs and the dining room, which opens entirely to the ample garden in the back, like an esplanade (terrace), looking from the inside in. 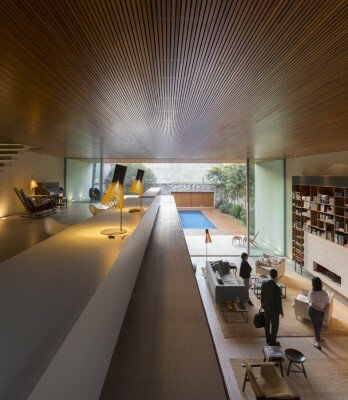 (de dentro para dentro). 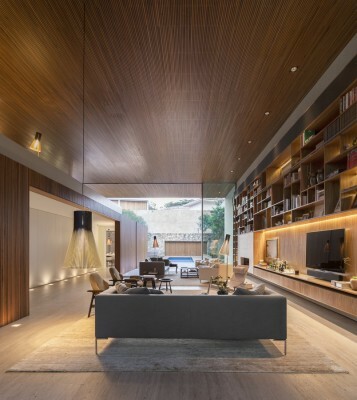 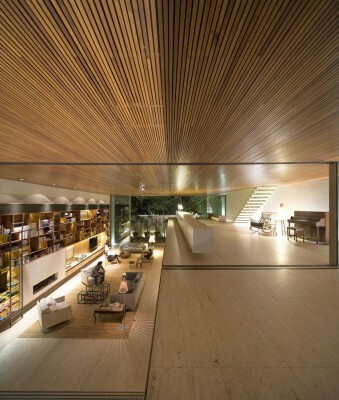 The ceiling of this living room, a slatted wooden lining – creates a cozy, intimate sensation, contrasting with the spatial sensation of larger monumentality of the lot. 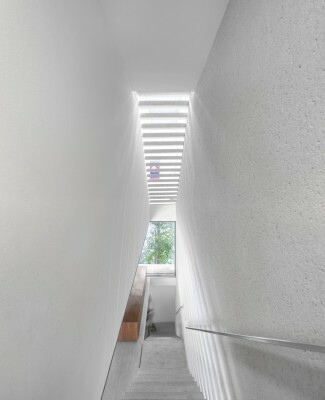 The four bedrooms, including a master suite looking out to the garden in the back, are on the floor upstairs. 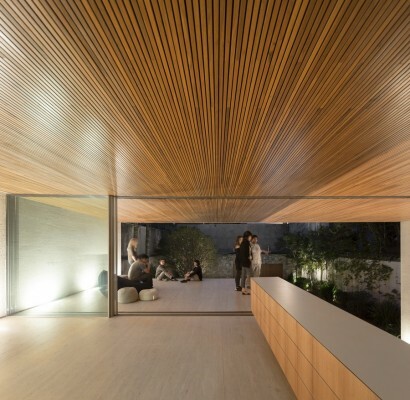 The seals – such as the wooden slats that function as a filter applied to movable panels – were designed to create greater comfort for the inner spaces. 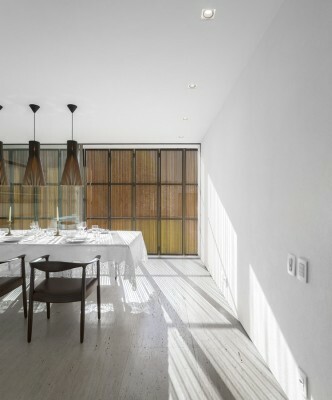 The sun’s heat, when the panels are closed, is retained by this type of brise soleil, while the wind continues to chill the inside. 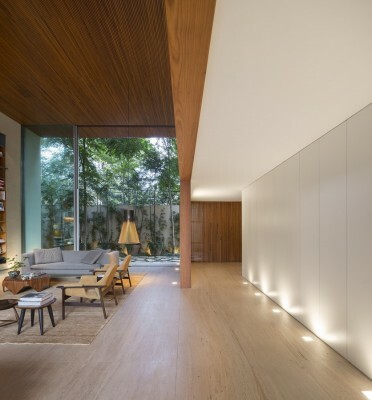 The shape of the lot, long and straight, has traced a longitudinal implantation of the house and the living room can have a cross-ventilation to the gardens. 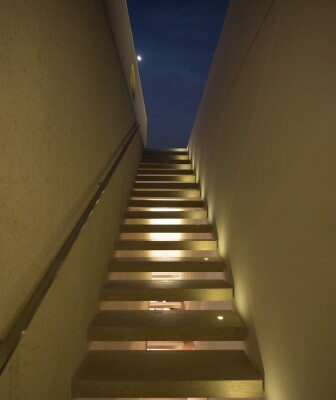 The wooden lining of the ground floor is prolonged to the outside and becomes the very façade. 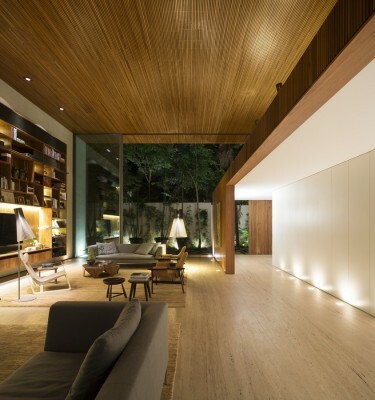 The stone on the floor of the living room goes out to the terrace and the same material on the inner walls continues out to the façade. 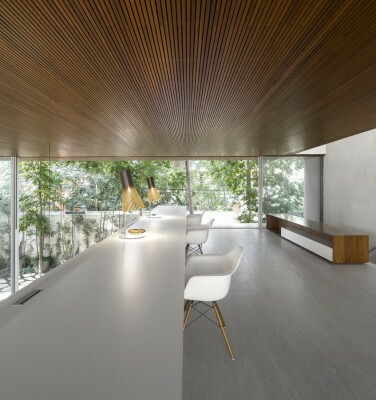 In this way, there is continuity not only of the circulation between the inside and out, but also of the materials, dissolving spatial limits.